Hello! I truly didn't fall off the face of the earth. I just have been down the the viral stuff that has been running rampant in our area. I still have some residual coughing but am a lot better. 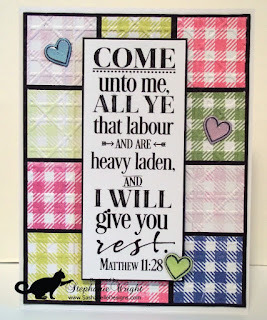 It's time for another challenge at Word Art Wednesday and this week we're going to Matthew 11:28, "Come unto me, all ye that labour and are heavy laden, and I will give you rest." This verse reminds me of how a child goes to its mother or father for comfort when life gets too overwhelming. The Lord wants us to do the same for us. 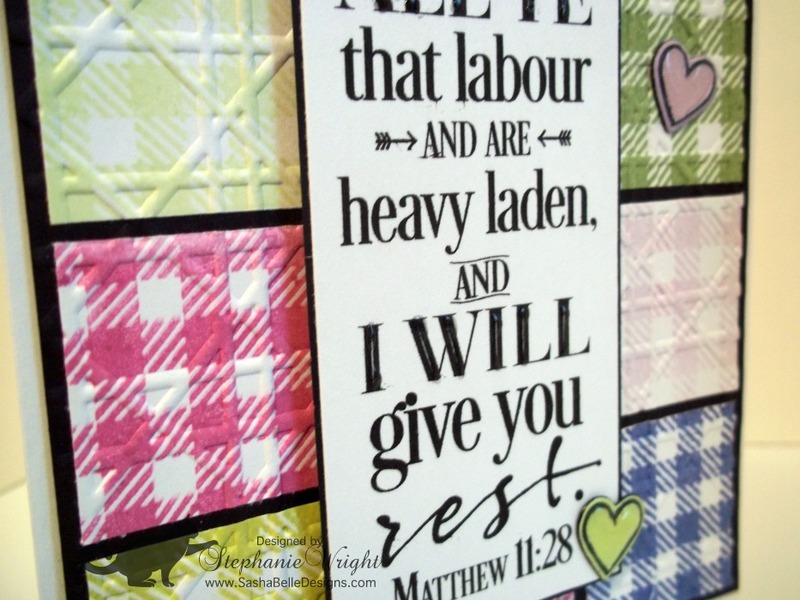 When we go to Him for comfort, He will not only provide comfort but will take the burdens and give us rest. He knows just what we need and the best way to give us the rest we need. I love that about Him. 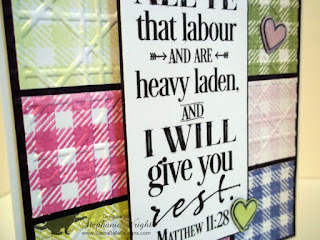 When I read this verse and thought about the rest that the Lord gives us, a quilt came to mind. What is more comforting on a cold day or during times of illness or stress than a cozy quilt. Our sponsor this week is Simon Says Stamp and I thought their Gingham Background stamp would be perfect for making my own paper quilt. I used various shades of Memento ink to stamp the background on scraps of white cardstock. I then cut these stamped scraps into 1.25" squares. I adhered them to a piece of black cardstock and then ran the entire panel through my Cuttlebug with a The Paper Studio Caning embossing folder. The rest of the card came together pretty easily. 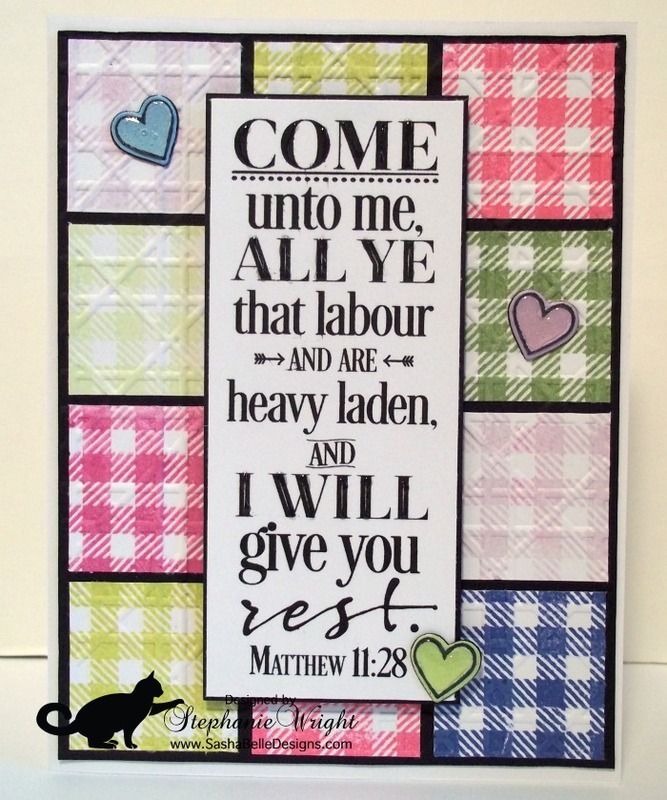 I matted the verse on another piece of black cardstock and used fun foam to pop it up over the quilt. I used the direct to paper technique to ink up some white cardstock with 3 of the colors in the quilt. I used the heart stamp from the Simon Says Stamp Christmas Cats to stamp black hearts on these ink swatches. I adhered two layers of black cardstock to the inked white cardstock and then used the coordinating die to cut out the hearts. After adhering them to the card front, they were coated with Glossy Accents. 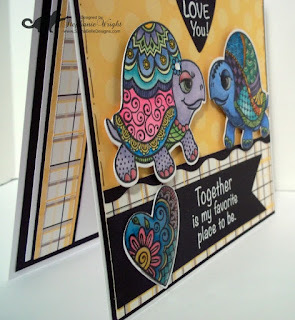 Glossy Accents was also added to some of the bold black lines in the sentiment for a little extra texture. Thanks for stopping by to visit with me today. I hope you'll stop by the Word Art Wednesday blog and see the rest of the projects made by the Design Team and pick up your free digi. A couple weeks ago, my husband and I were able to get away for a rare day trip to Columbus. We wanted to visit several of our favorite thrift stores and...because I needed some OSU specific papers for a customer order, we planned to visit my favorite scrapbook store. After picking out the papers, he was looking around the store while I was looking through the $0.25/sheet paper box. 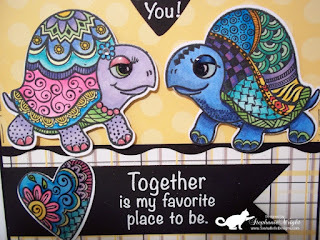 He saw a display card with these turtles and decided that I really needed to buy the stamp set and the dies too. :) He definitely spoils me. Of course, the first card I made with the set is for my hubby! The images were so much fun to color. There is one turtle in the die set. So for one turtle you can stamp and die cut and the other you die cut and stamp. I'm still working on both skills. Ha! I heat embossed the sentiments on black cardstock. I cut one into a fishtail banner and used the stamped and colored heart to anchor it. I used the heart die from the set to cut out both the colored heart and the embossed sentiment heart. A small Lawn Fawn heart die cut was colored with copics and added as an accent. 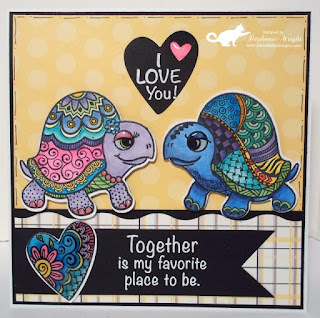 Glossy Accents was added to the eyes of both turtles, the girl turtle's toenails, the stamped and colored heart and the small Lawn Fawn heart. I think this adds fun texture and some shine. 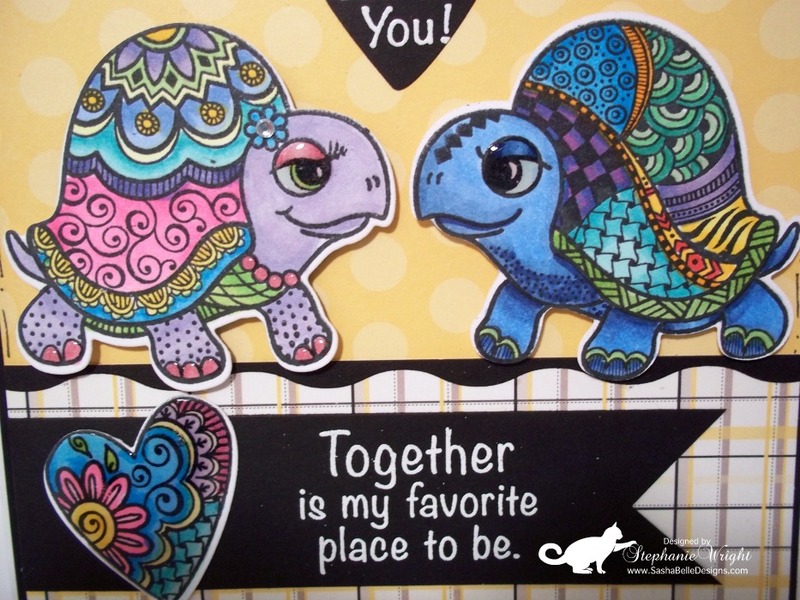 The turtles were popped up over the card using fun foam. Another border die cut was used to divide the two papers. The finished card is 5.5" square. 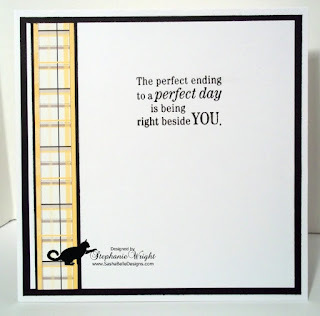 I was able to use another sentiment from the set on the interior of the card. I thought it was especially appropriate since we enjoyed such a nice day away. One of the neat features of the dies, is this one die set coordinates with at least 2 other stamp sets. What a great cost-saving feature!! 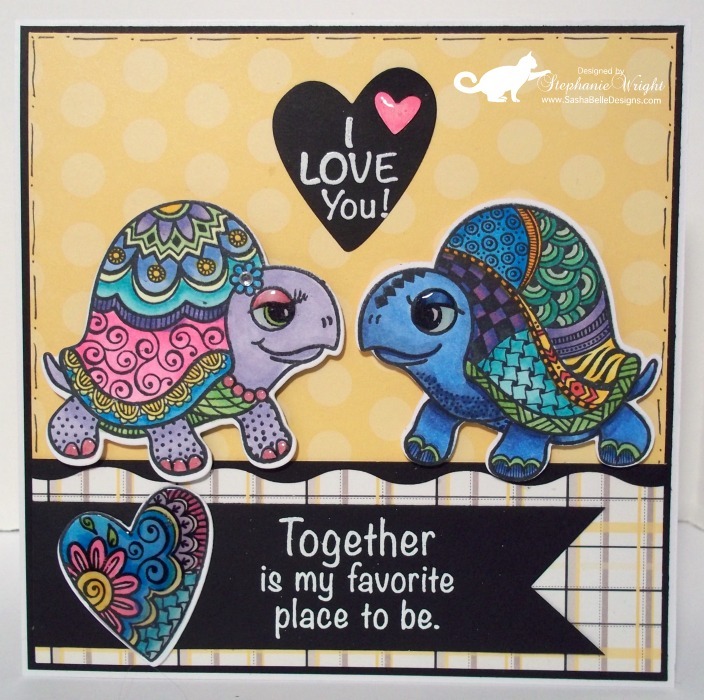 This 4 x 6 set has 6 sentiments and 3 images. Thanks for stopping by today. The products I used to make this card are listed below. Affiliate links are used where possible. The black pen I used for my doodling and the MFT Wavy Edge die are both retired. I've linked similar products that you could use instead below.